Oxford Picture Dictionary Second Edition: English-Chinese Edition: Bilingual Dictionary for Chinese-speaking teenage and adult students of English. 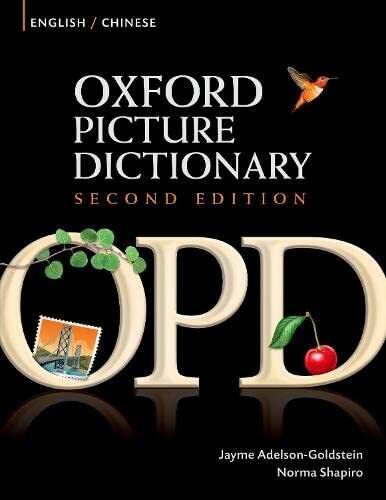 The English/Chinese version of the second edition of the best-selling and well loved Oxford Picture Dictionary, features over 4,000 words and phrases in both languages illustrated with all new vibrant, crystal-clear artwork. The topics, based on extensive input from teachers and students, have been thoroughly updated to meet the needs of today's English language learners. The new bilingual editions have complete second language indexes. 6. Oxford Picture Dictionary English-Chinese Edition: Bilingual Dictionary for Chinese-speaking teenage and adult students of English. 9. Oxford Picture Dictionary Second Edition: English-Chinese Edition: Bilingual Dictionary for Chinese-speaking teenage and adult students of English. 10. Oxford Picture Dictionary Second Edition: English-Chinese Edition: Bilingual Dictionary for Chinese-speaking teenage and adult students of English.